An independent study of the costs of seeking and imposing the death penalty in Oklahoma, prepared for the Oklahoma Death Penalty Review Commission, found that seeking the death penalty in Oklahoma "incurs significantly more time, effort, and costs on average, as compared to when the death penalty is not sought in first degree murder cases." The report—prepared by Seattle University criminal justice professors Peter A. Collins and Matthew J. Hickman and law professor Robert C. Boruchowitz, with research support by Alexa D. O’Brien—determined that, on average, Oklahoma capital cases cost 3.2 times more than non-capital cases. Reviewing 15 state studies of death penalty costs conducted between 2000 and 2016, the study found that, across the country, seeking the death penalty imposes an average of approximately $700,000 more in case-level costs than not seeking death. The researchers wrote that "all of these studies have found ... that seeking and imposing the death penalty is more expensive than not seeking it." The Oklahoma study reviewed 184 first-degree murder cases from Oklahoma and Tulsa counties in the years 2004-2010 and analyzed costs incurred at the pre-trial, trial, sentencing, and post-sentencing (appeals and incarceration) stages. Capital prosecutions, it found, cost the counties more than 1½ times the amount of incarceration costs than did non-capital trials because capital defendants spent an average of 324 more days in jail prior to and during death penalty trials. Prosecutors spent triple in pre-trial and trial costs on death penalty proceedings, while defense teams spent nearly 10 times more. Oklahoma capital appeal proceedings cost between five and six times more than non-capital appeals of first-degree murder convictions. The study "conservatively estimated" that an Oklahoma capital case cost $110,000 more on average than a non-capital case. The researchers said their results were "consistent with all previous research on death penalty costs, which have found that in comparing similar cases, seeking and imposing the death penalty is more expensive than not seeking it." They concluded, "It is a simple fact that seeking the death penalty is more expensive. There is not one credible study, to our knowledge, that presents evidence to the contrary." A February 2017 Fiscal Impact Report prepared by the Legislative Finance Committee of the New Mexico legislature estimated that bringing back the death penalty for three types of homicides in the state would cost as much as $7.2 million over the first three years. The report notes that "Between 1979 and 2007 when the death penalty was an option to prosecutors, there were over 200 death penalty cases filed, but only 15 men sentenced to death and only one execution." 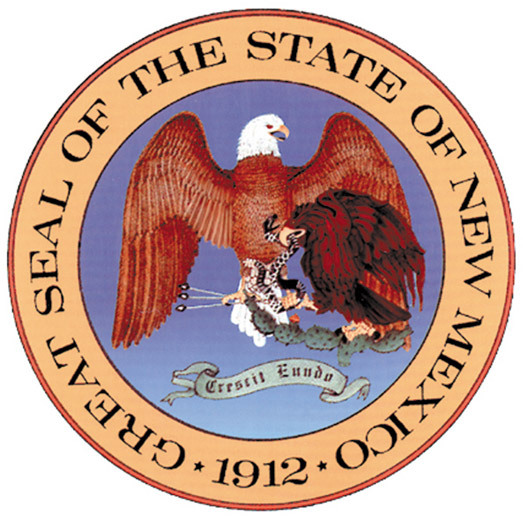 The Law Offices of the Public Defender reports that the defense costs for the two New Mexico death penalty cases that remain in the system following the prospective repeal of the state's death penalty statute have been $607.4 thousand for one case and $1.3 million for the other. The Fiscal Impact Report also contains a survey of costs incurred by a number of other states in administering their death penalty statutes. A new study by Lewis & Clark Law School and Seattle University that examined the costs of hundreds of aggravated murder and murder cases in Oregon has concluded that "maintaining the death penalty incurs a significant financial burden on Oregon taxpayers." The researchers found that the average trial and incarceration costs of an Oregon murder case that results in a death penalty are almost double those in a murder case that results in a sentence of life imprisonment or a term of years. Excluding state prison costs, the study found, cases that result in death sentences may be three to four times more expensive. The study found that 61 death sentences handed down in Oregon cost taxpayers an average of $2.3 million, including incarceration costs, while a comparison group of 313 aggravated murder cases cost an average of $1.4 million. Excluding state prison costs, the difference was even more stark: $1.1 million for death sentences vs. $315,159 for other cases. The study also found that death penalty costs were escalating over time, from $274,209 in the 1980s to $1,783,148 in the 2000s. (See chart. All costs are in 2016 dollars.) The study examined cost data from local jails, the Oregon Department of Corrections, the Office of Public Defense Services, and the Department of Justice, which provided information on appeals costs. Prosecution costs were not included because district attorney's office budgets were not broken down by time spent on each case. 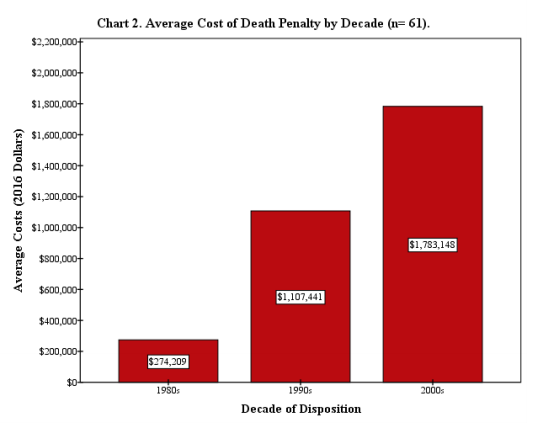 Among the reasons cited for the higher cost in death penalty cases were the requirement for appointment of death-qualified defense lawyers, more pre- and post-trial filings by both prosecutors and the defense, lengthier and more complicated jury selection practices, the two-phase death penalty trial, and more extensive appeals once a death sentence had been imposed. Professor Aliza Kaplan, one of the authors of the study, said, "The decision makers, those involved in the criminal justice system, everyone, deserves to know how much we are currently spending on the death penalty, so that when stakeholders, citizens and policy-makers make these decisions, they have as much information as possible to decide what is best for Oregon." Oregon has carried out just two executions since the death penalty was reinstated, both of inmates who waived their appeals. The state currently has a moratorium on executions. An August 2016 study of the costs of Nebraska's death penalty by Dr. Ernest Goss, a Creighton University economics professor who founded the conservative think tank, Goss & Associates, found that the state spends $14.6 million per year to maintain its capital punishment system. 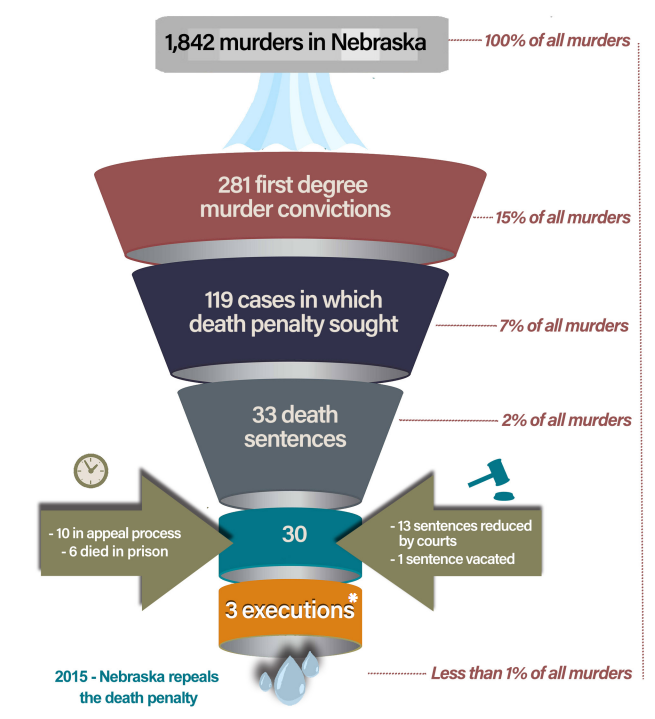 The study, The Economic Impact of the Death Penalty on the State of Nebraska: A Taxpayer Burden?, also estimated that each death penalty prosecution cost Nebraska's taxpayers about $1.5 million more than a life without parole prosecution. Conducting a meta-analysis of cost studies conducted across the country, Dr. Gross estimated that the death penalty costs states with capital punishment an average of $23.2 million more per year than alternative sentences. The study found that states with the death penalty spend about 3.54% of overall state budgets on court, corrections, and other criminal justice functions associated with the death penalty, while states without the death penalty spend about 2.93% on those functions. 1,842 homicides were committed in Nebraska between 1973 and 2014, with prosecutors seeking death 119 times and obtaining 33 death sentences. Of those sentenced to death, the study found that 13 had their sentences reduced, six died in prison, three were executed, one sentence was vacated, and ten are still appealing their sentences. The study was commissioned by Retain a Just Nebraska, an organization advocating for Nebraskans to vote to retain the Nebraska legislature's repeal of the state's death penalty in the November 2016 election. 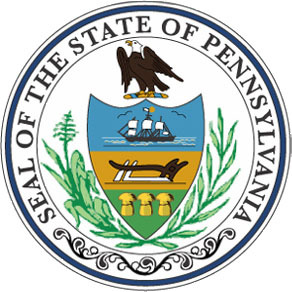 According to an investigation by The Reading Eagle, Pennsylvania has spent an estimated $272 million per execution since the Commonwealth reinstated its death penalty in 1978. Using data from a 2008 study by the Urban Institute, the Eagle calculated that cost of sentencing 408 people to death was an estimated $816 million higher than the cost of life without parole. The estimate is conservative, the paper says, because it assumes only one capital trial for each defendant and it does not include the cost of cases in which the death penalty was sought but not imposed. The total cost may exceed $1 billion. An earlier investigation had estimated a cost of at least $350 million, based on the 185 inmates who were on death row as of 2014, but additional research into the cases that had already been overturned, or in which inmates died or were executed prior to 2014, revealed a total of 408 people who had been sentenced to death. Two state analyses of the costs of the death penalty in Indiana found that "the out-of-pocket expenditures associated with death penalty cases were significantly more expensive than cases for which prosecuting attorneys requested either life without parole or a term of years." The first analysis, prepared by the Legislative Services Agency for the General Assembly, April 13, 2015, as a cost assessment for a bill that would make more cases eligible for the death penalty, found that the average cost of a capital murder case tried before a jury was $789,581, more than 4.25 times greater than the average cost of a murder case tried to a jury in which the prosecution sought life without parole ($185,422). The analysis also found that a death penalty case resolved by guilty plea still cost more than 2.33 times as much ($433,702) as a life-without-parole case tried to a jury. Read the April 2015 assessment. A second assessment prepared on May 4, 2015, in connection with a bill to add another aggravating circumstance to the state's death penalty statute found that the state share of out-of-pocket expenditures for death penalty cases tried to a jury ($420,234) was 2.77 times greater than its share of expenditures in life-without-parole case tried to a jury ($151,890). It also found that death penalty cases tried to a jury costs counties an average of $369,347 in out-of-pocket expenditures, 11 times more than the average county expenditure for life-without-parole case tried to a jury ($33,532). The assessment found that death penalty cases resolved by a plea agreement are still significantly more expensive than non-capital cases that go to trial. The $148,513 average expenditure counties paid for capital cases that were resolved by plea was 4.43 times more than their average expenditure for life-without-parole case tried to a jury. Read the May 2015 assessment. A Seattle University study examining the costs of the death penalty in Washington found that each death penalty case cost an average of $1 million more than a similar case where the death penalty was not sought ($3.07 million, versus $2.01 million). Defense costs were about three times as high in death penalty cases and prosecution costs were as much as four times higher than for non-death penalty cases. Criminal Justice Professor Peter Collins, the lead author of the study, said, “What this provides is evidence of the costs of death-penalty cases, empirical evidence. We went into it [the study] wanting to remain objective. This is purely about the economics; whether or not it’s worth the investment is up to the public, the voters of Washington and the people we elected.” (Although Washington's death penalty was reinstated in 1981, the study examined cases from 1997 onwards. Using only cases in the study, the gross bill to taxpayers for the death penalty will be about $120 million. Washington has carried out five executions since reinstatement, implying a cost of $24 million per execution. In three of those five cases, the inmate waived parts of his appeals, thus reducing costs.) The study was not able to include the likely higher yearly incarceration costs for death row inmates versus those not on death row. (J. Sullivan, "Seeking death penalty adds $1M to prosecution cost, study says," Seattle Times, January 7, 2015; P. Collins, et al., "An Analysis of the Economic Costs of Seeking the Death Penalty in Washington State," Seattle University, January 1, 2015). See earlier Washington study. A 2014 recent study commissioned by the Nevada legislature found that the average death penalty case costs a half million dollars more than a case in which the death penalty is not sought. The Legislative Auditor estimated the cost of a murder trial in which the death penalty was sought cost $1.03 to $1.3 million, whereas cases without the death penalty cost $775,000. The auditor summarized the study's findings, saying, "Adjudicating death penalty cases takes more time and resources compared to murder cases where the death penalty sentence is not pursued as an option. These cases are more costly because there are procedural safeguards in place to ensure the sentence is just and free from error." The study noted that the extra costs of a death penalty trial were still incurred even in cases where a jury chose a lesser sentence, with those cases costing $1.2 million. The study was based on a sample of Nevada murder cases and include the costs of incarceration. Because certain court and prosecution costs could not be obtained, the authors said the costs were, "understated," and may be higher than the estimates given. (C. Lochhead, "Audit: Death penalty nearly doubles cost of Nevada murder cases," Las Vegas Review-Journal, December 2, 2014; Legislative Auditor, "Performance Audit: Fiscal Costs of the Death Penalty," November 17, 2014). See earlier Nevada study. Defending a death penalty case costs about four times as much as defending a case where the death penalty is not sought, according to a new study by the Kansas Judicial Council. Examining 34 potential death-penalty cases from 2004-2011, the study found that defense costs for death penalty trials averaged $395,762 per case, compared to $98,963 per case when the death penalty was not sought. Costs incurred by the trial court showed a similar disparity: $72,530 for cases with the death penalty; $21,554 for those without. Even in cases that ended in a guilty plea and did not go to trial, cases where the death penalty was sought incurred about twice the costs for both defense ($130,595 v. $64,711) and courts ($16,263 v. $7,384), compared to cases where death was not sought. The time spent on death cases was also much higher. Jury trials averaged 40.13 days in cases where the death penalty was being sought, but only 16.79 days when it was not an option. Justices of the Kansas Supreme Court assigned to write opinions estimated they spent 20 times more hours on death penalty appeals than on non-death appeals. The Department of Corrections said housing prisoners on death row cost more than twice as much per year ($49,380) as for prisoners in the general population ($24,690). ("Report of the Judicial Council Death Penalty Advisory Committee," Judicial Council, Kansas Legislature, Feb. 13, 2014). See earlier Kansas study here. A new, but limited, study of the costs of the death penalty in Idaho found that capital cases are more costly and take much more time to resolve than non-capital cases. One measure of death-penalty costs was reflected in the time spent by attorneys handling appeals. The State Appellate Public Defenders office spent about 44 times more time on a typical death penalty appeal than on a life sentence appeal (almost 8,000 hours per capital defendant compared to about 180 hours per non-death penalty defendant). Capital cases with trials took 20.5 months to reach a conclusion while non-capital cases with trials took 13.5 months. The study was commissioned by the Joint Legislative Oversight Committee and performed by the Office of Performance Evaluations.The study also noted how infrequently the death penalty was applied in Idaho: of the 251 defendants who were charged with first-degree murder since 1998, the death penalty was sought against 55 (22%) of them, and just 7 were sentenced to death. More than half of the 40 people sentenced to death since 1977 have received lesser sentences after their death sentences were overturned. ("Financial Costs of the Death Penalty," Office of Performace Evaluations, Idaho Legislature, March 17, 2014). A new study of the cost of the death penalty in Colorado revealed that capital proceedings require six times more days in court and take much longer to resolve than life-without-parole (LWOP) cases. The study, published in the University of Denver Criminal Law Review, found that LWOP cases required an average of 24.5 days of in-court time, while the death-penalty cases required 147.6 days. The authors noted that selecting a jury in an LWOP case takes about a day and a half; in a capital case, jury selection averages 26 days. In measuring the comparative time it takes to go from charging a defendant to final sentencing, the study found that LWOP cases took an average of 526 days to complete; death cases took almost 4 calendar years longer--1,902 days. The study found that even when a death-penalty case ends in a plea agreement and a life sentence, the process takes a year and a half longer than an LWOP case with a trial. (J. Marceau and H. Whitson, "The Cost of Colorado's Death Penalty," 3 Univ. of Denver Criminal Law Review 145 (2013)). 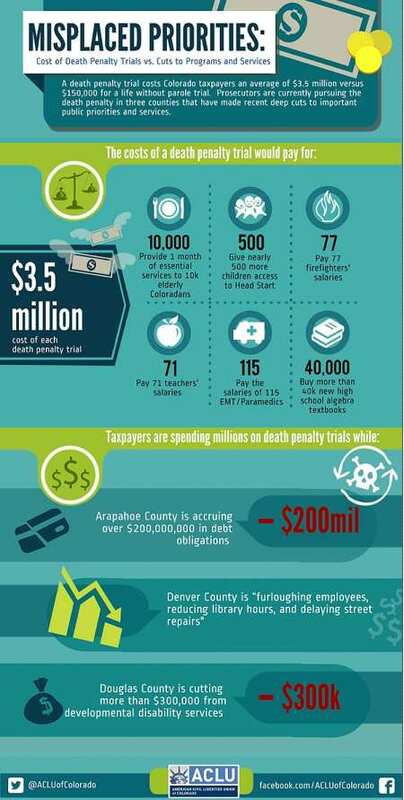 Click on image at left to view infographic on Costs in Colorado (ACLU of CO). The authors calculated that, if the Governor commuted the sentences of those remaining on death row to life without parole, it would result in an immediate savings of $170 million per year, with a savings of $5 billion over the next 20 years. Using conservative rough projections, the Commission estimates the annual costs of the present (death penalty) system to be $137 million per year. The cost of the present system with reforms recommended by the Commission to ensure a fair process would be $232.7 million per year. The cost of a system in which the number of death-eligible crimes was significantly narrowed would be $130 million per year. The cost of a system which imposes a maximum penalty of lifetime incarceration instead of the death penalty would be $11.5 million per year. (Commission on the Fair Administration of Justice, June 30, 2008). See more California information below. A study released by the Urban Institute on March 6, 2008 forecast that the lifetime cost to taxpayers for the capitally-prosecuted cases in Maryland since 1978 will be $186 million. That translates to $37.2 million for each of the state’s five executions since the state reenacted the death penalty. The study estimates that the average cost to Maryland taxpayers for reaching a single death sentence is $3 million - $1.9 million more than the cost of a non-death penalty case. (This includes investigation, trial, appeals, and incarceration costs.) The study examined 162 capital cases that were prosecuted between 1978 and 1999 and found that those cases will cost $186 million more than what those cases would have cost had the death penalty not existed as a punishment. At every phase of a case, according to the study, capital murder cases cost more than non-capital murder cases. Of the 162 capital cases, there were 106 cases in which a death sentence was sought but not handed down in Maryland. Those cases cost the state an additional $71 million compared to the cost non-death penalty cases. Those costs were incurred simply to seek the death penalty where the ultimate outcome was a life or long-term prison sentence. (J. McMenamin, “Death penalty costs Md. more than life term,” Baltimore Sun, March 6, 2008). Read the entire study here. Clark County public defense attorneys spent an average of 2,298 hours on a capital murder case compared to an average of 1,087 hours on a non-capital murder case--a difference of 1,211 hours, or 112%. Defending the average capital murder case in Clark County cost $229,800 for a Public Defender or $287,250 for appointed counsel. The additional cost of capital murder cases was $170,000 to $212,000 per case compared to the cost of a non-capital murder case in the same county. The 80 pending capital murder cases in Clark County will cost approximately $15 million more than if they were prosecuted without seeking the death penalty. Clark County cases that resulted in a death sentence that concluded between 2009 and 2011 took an average of 1,107 days, or just over 3 years, to go from initial filing to sentencing. In contrast, cases that resulted in life without parole took an average of 887 days (2.4 years) to go from initial filing to sentencing. Of the 35 completed cases in Clark County from 2009 to 2011 where a Notice of Intent to seek the death penalty was filed, 69% resulted in a life sentence. Nearly half (49%) ultimately resulted in a sentence of life without parole, and the next most common disposition was a sentence of life with parole (20%). Only 5 of the 35 cases (14%) resulted in a death sentence. The study did not include the costs of prosecution or all appelate expenses. The author noted: "It is important to note that this statistical extrapolation does not cover the full array of time spent in capital cases by other court officials (e.g. judges, prosecutors, jurors), staff and administrative personnel, mitigation specialists, investigators, and expert witnesses. It also does not take into account the additional costs of capital litigation that are associated with state/federal appeals and the extra costs of imprisonment of death eligible inmates pending trial and sentencing." (T. Miethe, "Estimates of Time Spent in Capital and Non-Capital Murder Cases: A Statistical Analysis of Survey Data from Clark County Defense Attorneys," Department of Criminal Justice, University of Nevada, Las Vegas, February 21, 2012). The average cost of defending a trial in a federal death case is $620,932, about 8 times that of a federal murder case in which the death penalty is not sought. A study found that those defendants whose representation was the least expensive, and thus who received the least amount of attorney and expert time, had an increased probability of receiving a death sentence. Defendants with less than $320,000 in terms of representation costs (the bottom 1/3 of federal capital trials) had a 44% chance of receiving a death sentence at trial. On the other hand, those defendants whose representation costs were higher than $320,000 (the remaining 2/3 of federal capital trials) had only a 19% chance of being sentenced to death. Thus, the study concluded that defendants with low representation costs were more than twice as likely to receive a death sentence. The complete report can be found here. (Office of Defender Services of the Administrative Office of the U.S. Courts, "Update on Cost, Quality, and Availability of Defense Representation in Federal Death Penalty Cases," June 2008; prepared by Jon Gould and Lisa Greenman). Further update at J. Gould and L. Greenman, "Report to the Committee on Defender Services-Judicial Conference of the United States," September 2010. At the trial level, death penalty cases are estimated to generate roughly $470,000 in additional costs to the prosecution and defense over the cost of trying the same case as an aggravated murder without the death penalty and costs of $47,000 to $70,000 for court personnel. On direct appeal, the cost of appellate defense averages $100,000 more in death penalty cases, than in non-death penalty murder cases. Personal restraint petitions filed in death penalty cases on average cost an additional $137,000 in public defense costs. (FINAL REPORT OF THE DEATH PENALTY SUBCOMMITTEE OF THE COMMITTEE ON PUBLIC DEFENSE, Washington State Bar Association, December 2006). A New Jersey Policy Perspectives report concluded that the state's death penalty has cost taxpayers $253 million since 1983, a figure that is over and above the costs that would have been incurred had the state utilized a sentence of life without parole instead of death. The study examined the costs of death penalty cases to prosecutor offices, public defender offices, courts, and correctional facilities. 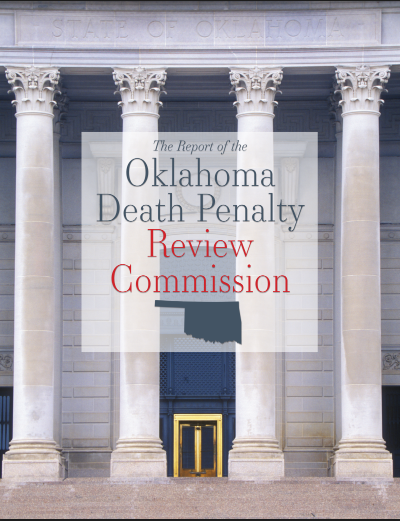 The report's authors said that the cost estimate is "very conservative" because other significant costs uniquely associated with the death penalty were not available. 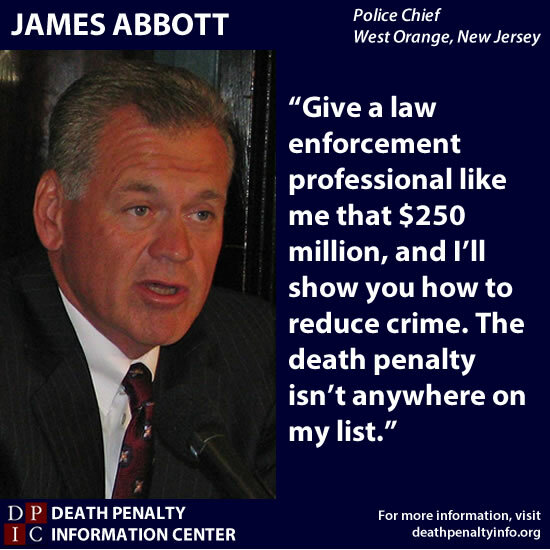 "From a strictly financial perspective, it is hard to reach a conclusion other than this: New Jersey taxpayers over the last 23 years have paid more than a quarter billion dollars on a capital punishment system that has executed no one," the report concluded. Since 1982, there have been 197 capital trials in New Jersey and 60 death sentences, of which 50 were reversed. There have been no executions, and 10 men are housed on the state's death row. Michael Murphy, former Morris County prosecutor, remarked: "If you were to ask me how $11 million a year could best protect the people of New Jersey, I would tell you by giving the law enforcement community more resources. I'm not interested in hypotheticals or abstractions, I want the tools for law enforcement to do their job, and $11 million can buy a lot of tools." (See Newsday, Nov. 21, 2005; also Press Release, New Jerseyans for Alternatives to the Death Penalty, Nov. 21, 2005). Read the Executive Summary. Read the full report. Read the NJADP Press Release. New York reinstated the death penalty in 1995. In 2004, the state's high court overturned the law. Eventually, all 7 death sentences that had been imposed were overturned. No one was executed. The legislature repeatedly rejected attempts to reinstate the death penalty. During the time when the law was in effect, NY spent about $170 million over 9 years, producing no final death sentences or executions. (See D. Wise, “Capital Punishment Proves to Be Expensive,” New York Law Journal, April 30, 2002, at p.1; see also “Costly Price of Capital Punishment—Case Shows Effort Expended Before the State takes a Life,” Albany Times-Union, Sept. 22, 2003 (over $160 million spent in 7 years); N.Y. Times, Feb. 28, 2005 (citing costs of $170 million). One of the earliest cost studies was prepared by the N.Y. State Defenders Association in 1982 as the state was considering reinstating the death penalty. The report concluded that state and county charges for the defense, prosecution, and courts would be about $1.8 million per case through trial, initial state appeal, and appeal to the U.S. Supreme Court. The first 40 cases when tried to a verdict would cost the state over $59 million. (J. Gradess, "Capital Losses: The Price of the Death Penalty for New York State," NY State Defenders Assn., April 1, 1982). Death penalty trials cost an average of 48% more than the average cost of trials in which prosecutors seek life imprisonment. Tennessee District Attorneys General are not consistent in their pursuit of the death penalty. Surveys and interviews of district attorneys indicate that some prosecutors "use the death penalty as a 'bargaining chip' to secure plea bargains for lesser sentences." Previous research provides no clear indication whether the death penalty acts as a method of crime prevention. The Tennessee Court of Criminal Appeals reversed 29 percent of capital cases on direct appeal. Read the The Tennessee Comptroller of the Treasury Office of Research's Report, "Tennessee's Death Penalty: Costs and Consequences" (2004). The investigation costs for death-sentence cases were about 3 times greater than for non-death cases. The trial costs for death cases were about 16 times greater than for non-death cases ($508,000 for death case; $32,000 for non-death case). The appeal costs for death cases were 21 times greater. The costs of carrying out (i.e. incarceration and/or execution) a death sentence were about half the costs of carrying out a non-death sentence in a comparable case. Trials involving a death sentence averaged 34 days, including jury selection; non-death trials averaged about 9 days. (Performance Audit Report: Costs Incurred for Death Penalty Cases: A K-GOAL Audit of the Department of Corrections, Dec. 2003) Read DPIC's Summary of the Kansas Cost Report. Capital cases burden county budgets with large unexpected costs, according to a report released by the National Bureau of Economic Research, "The Budgetary Repercussions of Capital Convictions," by Katherine Baicker. Counties manage these high costs by decreasing funding for highways and police and by increasing taxes. 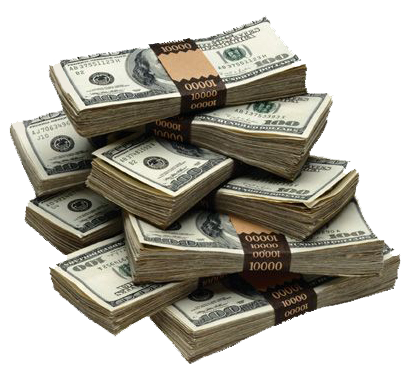 The report estimates that between 1982-1997 the extra cost of capital trials was $1.6 billion. (NBER Working Paper No. w8382, Issued in July 2001) Read the abstract. A state analysis of the costs of the death penalty in Indiana found the average cost to a county for a trial and direct appeal in a capital case was more than ten times more than a life-without-parole case. The average capital case resulting in a death sentence cost $449,887, while the average cost of case in which a life-without-parole sentence was sought and achieved was only $42,658. The study was prepared by the Legislative Services Agency for the General Assembly, Jan. 2010, as a cost assessment for a bill that would make more cases eligible for the death penalty. Read the assessment. A recent study published by a Duke University economist revealed North Carolina could save $11 million annually if it dropped the death penalty. Philip J. Cook, a professor at Duke University's Sanford School of Public Policy, calculated the extra state costs of the death penalty during fiscal years 2005 and 2006. He calculated over $21 million worth of expenses that would have been saved if the death penalty had been repealed. The total included extra defense costs for capital cases in the trial phase, extra payments to jurors, post-conviction costs, resentencing hearings, and the extra costs to the prison system. This conservative estimate did not include resources that would have been freed up in the Office of the Appellate Defender and the North Carolina Supreme Court, the extra time spent by prosecutors in capital cases, and the costs to taxpayers for federal appeals. The most comprehensive death penalty study in the country found that the death penalty costs North Carolina $2.16 million more per execution than the a non-death penalty murder case with a sentence of life imprisonment (. On a national basis, these figures translate to an extra cost of over $1 billion spent since 1976 on the death penalty. ("The Costs of Processing Murder Cases in North Carolina" Duke University, May 1993). California spends $90 Million dollars annually above and beyond the ordinary costs of the justice system on capital cases. $78 million of that total is incurred at the trial level (Sacramento Bee, March 18, 1988). In January 2003, despite a budge deficit, California Governor Gray Davis proposed building a new $220 million state of the art death row. ("San Quentin Debate: Death Row vs. Bay Views, New York Times, December 18, 2004). According to state and federal records obtained by The Los Angeles Times, maintaining the California death penalty system costs taxpayers more than $114 million a year beyond the cost of simply keeping the convicts locked up for life. This figure does not count the millions more spent on court costs to prosecute capital cases. The Times concluded that Californians and federal taxpayers have paid more than a quarter of a billion dollars for each of the state's 11 executions, and that it costs $90,000 more a year to house one inmate on death row, where each person has a private cell and extra guards, than in general prison population. This additional cost per prisoner adds up to $57.5 million in annual spending. ("Death Row Often Means a Long Life," Los Angeles Times, March 6, 2005). A study done by the Sacramento Bee (March 28, 1988) suggests that California would save $90 million per year if it were to abolish the death penalty. $78 million of these expenses are occurred at the trial level and would not be reduced by shortening appeals. ("CLOSING DEATH ROW WOULD SAVE STATE $90 MILLION A YEAR," Sacramento Bee, March 28, 1988). "[T]he average cost of defending a death penalty case at the trial level over the last ten years was $438,651, while the average cost of defending a non-death aggravated murder case at the trial level was $216,693, less than half. The Department of Justice has spent on average $66,728.65 and 818.5 attorney hours on just direct automatic appeals in the cases of 61 defendants (for a total amount of $4,070,447.60 and 49,928.80 hours respectively)." A. Kaplan, "Oregon's Death Penalty: The Practical Reality," 17 Lewis & Clark Law Review 1, 36 (2013). According to an estimate by Dr. Bill Long, "Costs of the Oregon Death Penalty I, prepared for testimony at a capital trial, the cost of putting a person to death in Oregon is at least 50% more, and may be up to five times as much as the cost of a life without parole sentence. (See Kaplan, above at 36). Oregon taxpayers have paid approximately $2.2 million on the case of Randy Lee Guzek, who has been on death row for 24 years and is still not at the end of his appeals. (See Kaplan, above at 39). Each death penalty case in Texas costs taxpayers about $2.3 million. That is about three times the cost of imprisoning someone in a single cell at the highest security level for 40 years. ("Executions Cost Texas Millions," Dallas Morning News, March 8, 1992). Testimony of Richard C. Dieter, Executive Director, Death Penalty Information Center, before the Maryland Commission on Capital Punishment regarding the costs of the death penalty and related issues (Sept. 5, 2008). Testimony of Richard C. Dieter, Executive Director, Death Penalty Information Center, before the Nevada Advisory Commission on the Administration of Justice regarding the costs of the death penalty and related issues (July 7, 2008; telephonic testimony). "Costs of the Death Penalty and Related Issues" Testimony of Richard C. Dieter, Executive Director, Death Penalty Information Center, before the Colorado Senate Judiciary Committee. 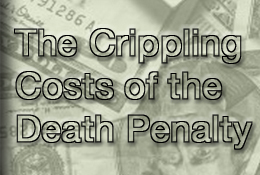 (February 7, 2007) This is a comprehensive description of the death penalty process and related costs. See also "Fighting Crime in the U.S. and Internationally: Is the Death Penalty Necessary? A Unique Conversation Between U.S. and European Law Enforcement," A panel of law enforcement officials from the U.S. and Europe discussing the merits of the death penalty in reducing violent crime. The officers also addressed whether capital punishment actually helps to keep citizens safe, assists healing for victims, and uses crime-fighting resources efficiently. (Washington, D.C., October 13, 2010). 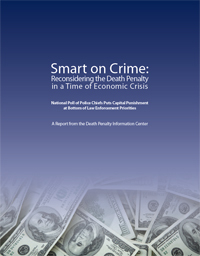 The Death Penalty Information Center's report, "Smart on Crime: Reconsidering the Death Penalty in a Time of Economic Crisis," was released in October 2009. The report combines an analysis of the costs of the death penalty with a national poll of police chiefs, who put capital punishment at the bottom of their law enforcement priorities. Click here to read DPIC's press release. Click here for the Executive Summary of the report. The death penalty in the U.S. is an enormously expensive and wasteful program with no clear benefits. All of the studies on the cost of capital punishment conclude it is much more expensive than a system with life sentences as the maximum penalty. In a time of painful budget cutbacks, states are pouring money into a system that results in a declining number of death sentences and executions that are almost exclusively carried out in just one area of the country. As many states face further deficits, it is an appropriate time to consider whether maintaining the costly death penalty system is being smart on crime. 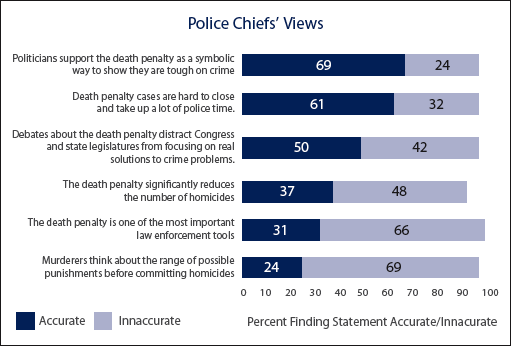 The nation’s police chiefs rank the death penalty last in their priorities for effective crime reduction. The officers do not believe the death penalty acts as a deterrent to murder, and they rate it as one of the most inefficient uses of taxpayer dollars in fighting crime. Criminologists concur that the death penalty does not effectively reduce the number of murders. Around the country, death sentences have declined 60% since 2000 and executions have declined almost as much. Yet maintaining a system with 3,300 people on death row and supporting new prosecutions for death sentences that likely will never be carried out is becoming increasingly expensive and harder to justify. The money spent to preserve this failing system could be directed to effective programs that make society safer. (Released Oct. 20, 2009). See other DPIC reports and Costs. As the economic crisis has put many states in a budgetary freeze, officials must choose between funds needed for a broad variety of safety issues and those needed to prosecute capital crimes. Crime prevention, mental health treatment, education, victim services and drug treatment programs compete for the same funds as death penalty cases. Why is the death penalty so expensive? Legal costs: Almost all people facing the death penalty cannot afford their own attorney. The state must assign them two public defenders, and pay for the costs of the prosecution as well. Pre-trial costs: Capital cases are far more complicated than non-capital cases. Experts will probably be needed on forensic evidence, mental health and the social history of the defendant. Jury selection: Because of the death penalty question, jury selection in capital cases is much more time consuming and expensive. Trial: Death penalty trials can last over four times longer, requiring juror and attorney compensation, in addition to court personnel and other related costs. Incarceration: Most death rows involve solitary confinement in a special facility. These require more security and other accommodations as the prisoners are kept for 23 hours a day in their cells. Appeals: To minimize mistakes, every inmate is entitled to a series of appeals. The costs are borne at taxpayers' expense. These appeals are essential because some inmates have come within hours of execution before evidence was uncovered proving their innocence. In 2009, legislation was introduced to abolish the death penalty in many states, including New Mexico, Kansas, Montana, Nebraska, Colorado, New Hampshire, Connecticut and Maryland. The high costs of the death penalty were repeatedly cited in these debates. Republican Senator Carolyn McGinn introduced the repeal measure in Kansas. She said the penalty is too costly, does not benefit the people, and should be replaced with life without parole. Her op-ed about the bill can be found here. Cases without the death penalty cost $740,000, while cases where the death penalty is sought cost $1.26 million. Maintaining each death row prisoner costs taxpayers $90,000 more per year than a prisoner in general population. There are 714 inmates on California's death row. The costs for a non-death penalty murder case is $1.1 million ($870,000 in imprisonment, $250,000 in trial), while the costs for a death penalty case are $3 million ($1.3 million in imprisonment, $1.7 million in trial). "Investment in education is about the future, and it is about hope. Investment in prisons and especially in the death penalty is about a final reckoning, an admission of gross failure." Editorial, The Daily Astorian (OR), April 23, 2009. "There is simply no place for such an enormously expensive government program that accomplishes nothing. And on that criterion alone, the death penalty ought to die." Jim Oppedahl, former court administrator in Montana, Helena Independent Record, Feb. 2, 2009. For more information, see DPIC's Page on Cost. For a downloadable podcast about cost, click here.